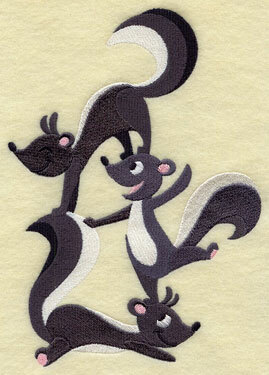 Encore, encore! 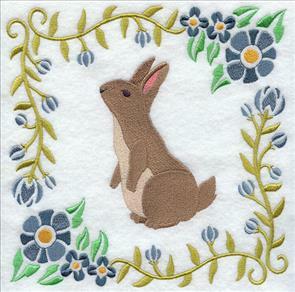 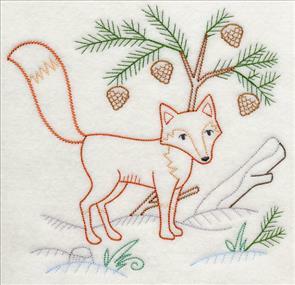 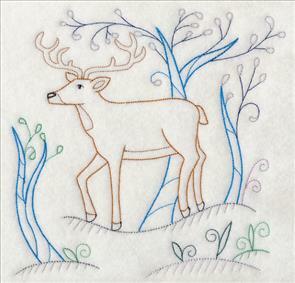 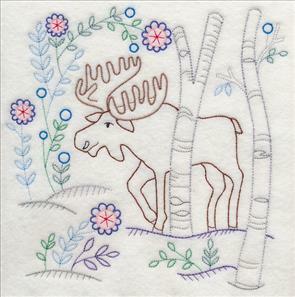 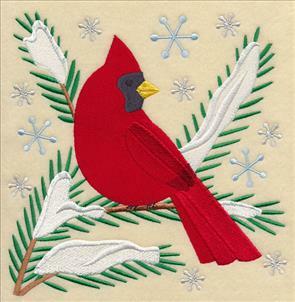 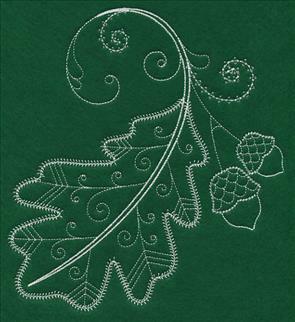 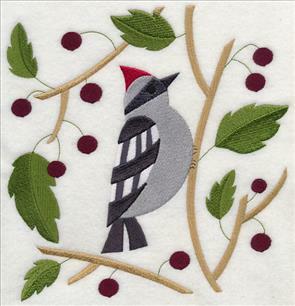 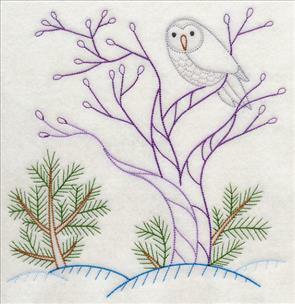 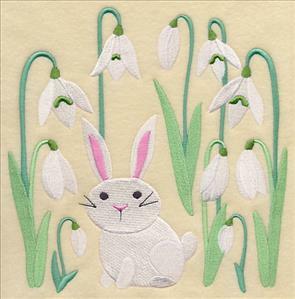 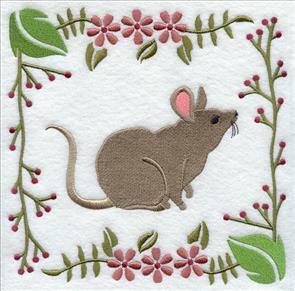 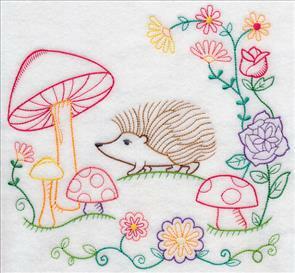 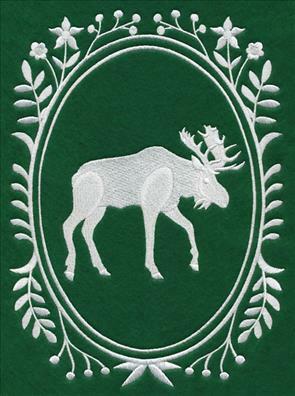 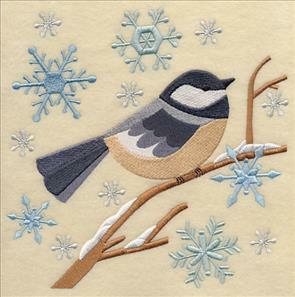 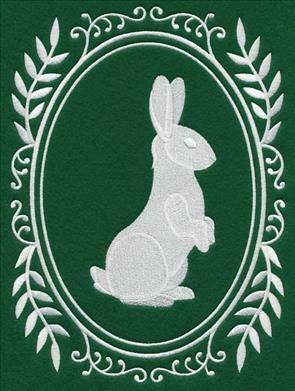 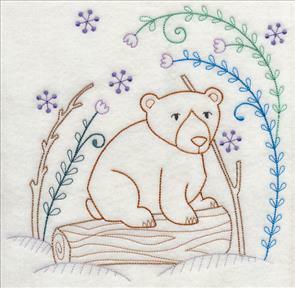 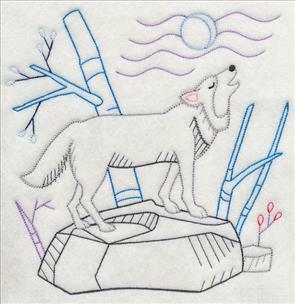 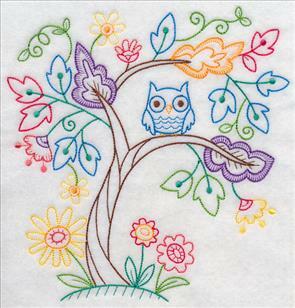 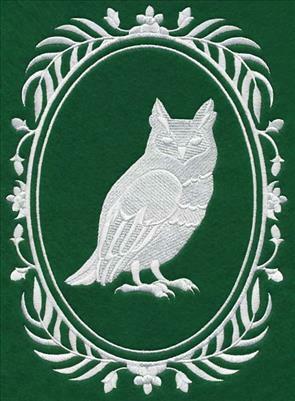 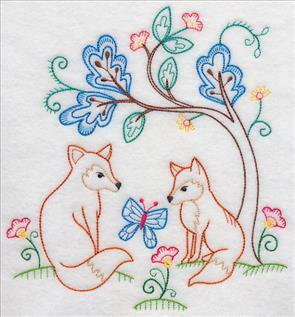 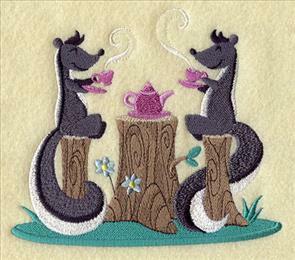 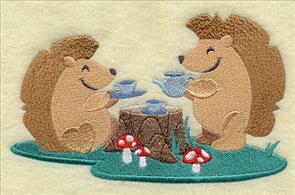 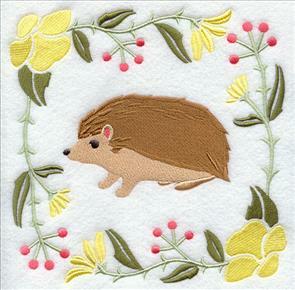 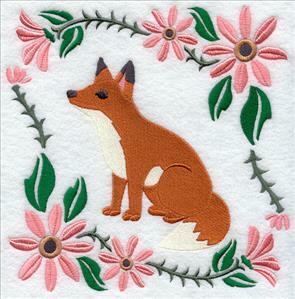 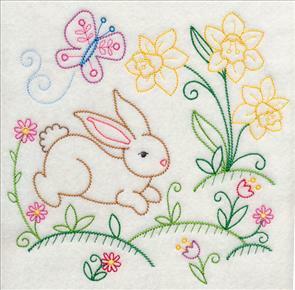 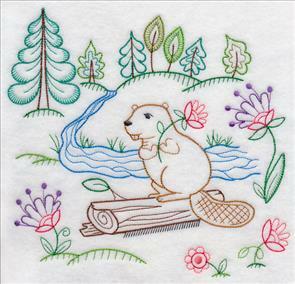 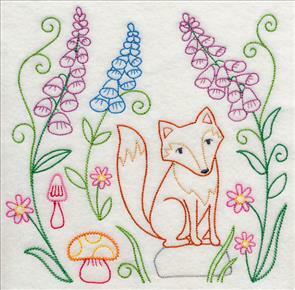 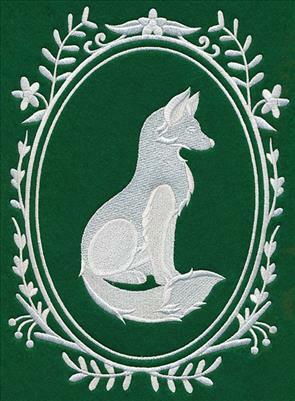 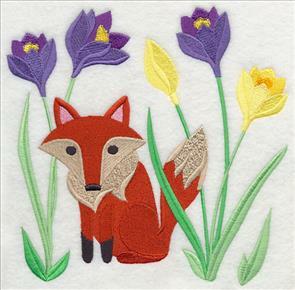 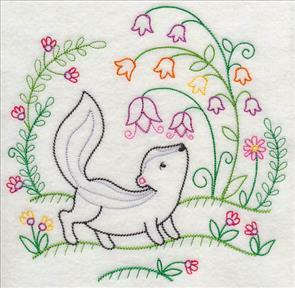 It's an embroidery encore weekend with all new whitework woodland designs! 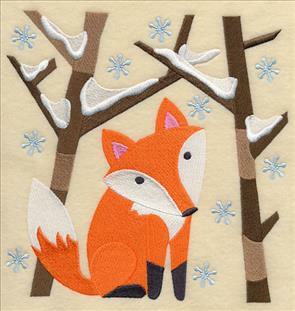 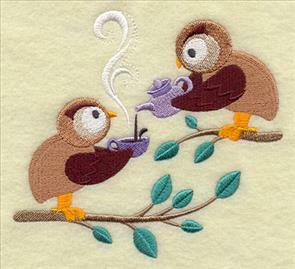 Love this week's new woodland designs? 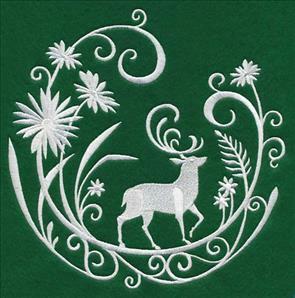 Add to the mix with dramatic and eye-catching woodland whitework! 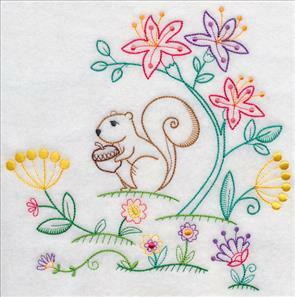 New designs featuring flowers, animals, pinecones, feathers, and other all-natural motifs are one-color wonders (and full of elegance and beauty!). 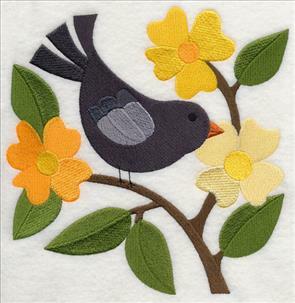 Stitch them on a variety of projects -- from everyday tote bags and apparel to cabin-ready quilts and pillows! 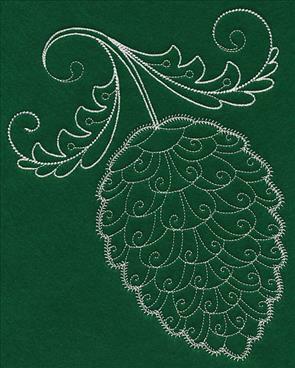 The light and airy style of this whitework pinecone makes it a terrific addition to tea towels and other kitchen decor. 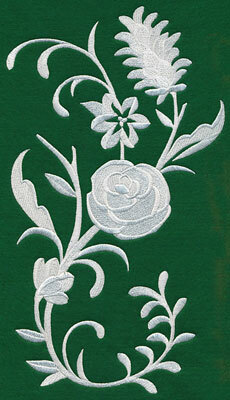 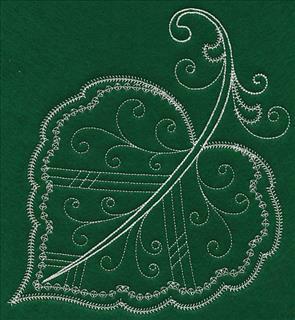 Elegant whitework designs are full of sophistication and beauty -- especially when depicting gorgeous floral motifs. 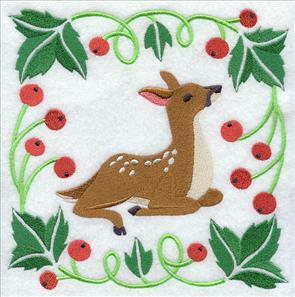 Here, a fanciful wreath is gorgeous when stitched on pillows, quilt blocks, and other home decor. 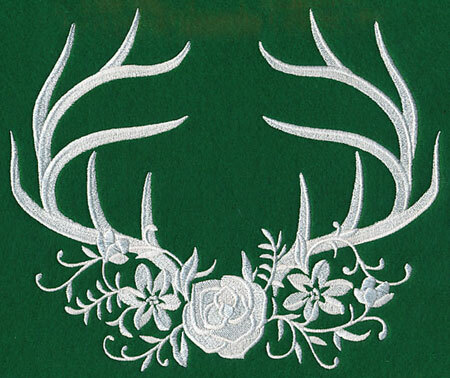 7.80" x 7.82" and 6.85" x 6.87" and 5.85" x 5.87" and 4.85" x 4.86" and 3.86" x 3.88"
An exquisite antler design with floral accents is also a striking addition to embroidery projects. 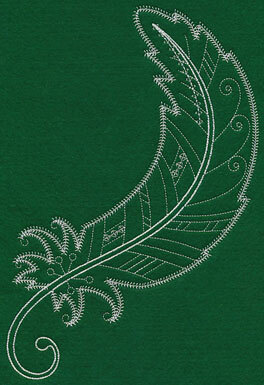 The whitework especially gives the natural elements a bright and bold appearance. 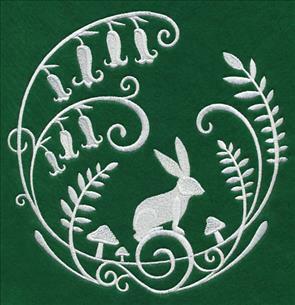 8.10" x 6.85" and 7.52" x 6.36" and 6.52" x 5.51" and 5.75" x 4.86" and 3.87" x 3.27"
Stitch these woodland whitework designs on a variety of projects, including apparel, placemats, quilts, and more. 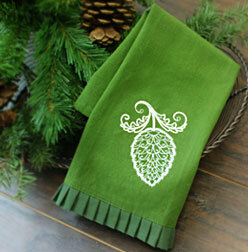 They're sure to add a graceful and chic appeal to any decor item. 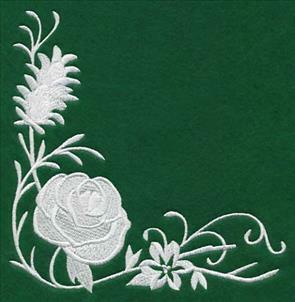 6.69" x 11.75" and 5.36" x 9.41"
4.45" x 7.81" and 3.90" x 6.85"
Use this whitework floral spray as an embellishment for your favorite blouse. 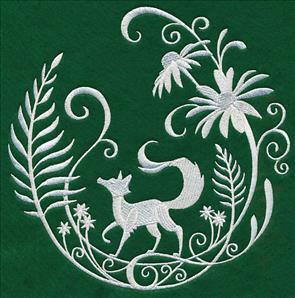 A border created in the chic whitework style is the perfect accompaniment to the other woodland floral designs above. 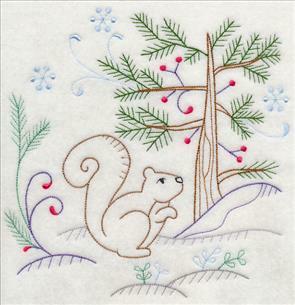 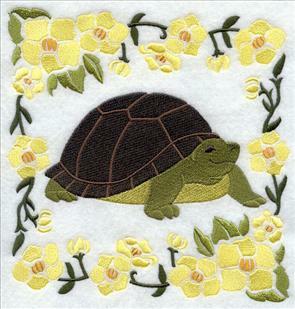 Stitch it on placemats, table linens, quilt borders, and more. 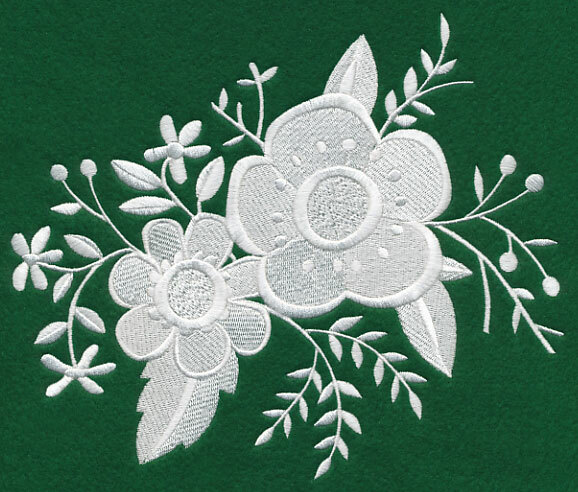 11.75" x 4.40" and 9.41" x 3.52" and 7.81" x 2.93" and 6.00" x 2.47" and 3.86" x 1.45"
A second border stitched in the graceful whitework style is a terrific way to add sophistication to your embroidery projects. 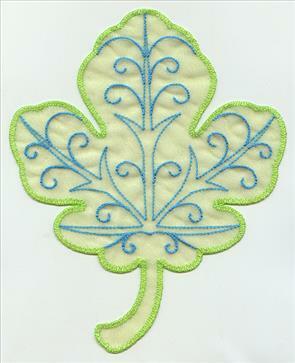 Stitch it with the first border above, or use it on its own for a stunning accent. 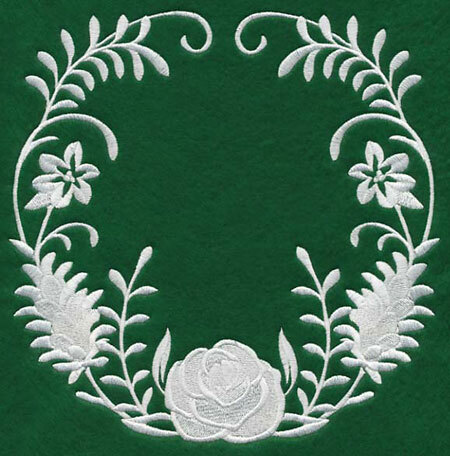 11.75" x 2.92" and 9.41" x 2.34" and 7.81" x 1.95" and 6.00" x 1.77" and 3.86" x 0.98"
Use the whitework corner and flower designs below to highlight a pocket, napkin, or placemat. 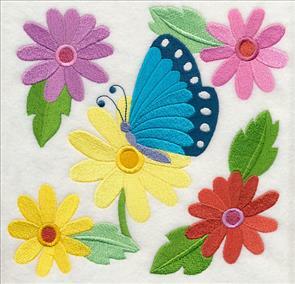 The combination of several types of flowers in these designs give them a unique, eye-catching appeal. 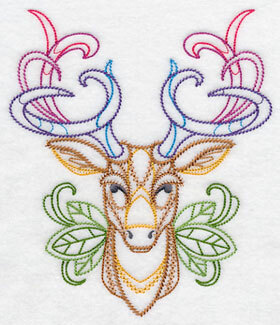 Order the designs individually by clicking the links above, or get the design pack. 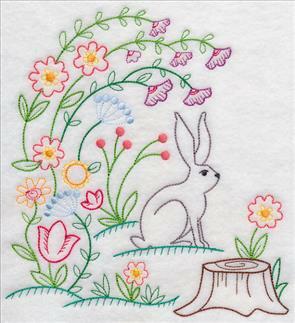 Big, bold flowers and sprigs of foliage fill this bouquet with the beauty of the forest. 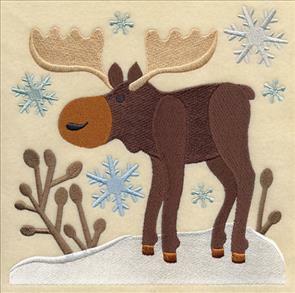 Use it as a way to evoke images of woodsy wildlife in your home decor. 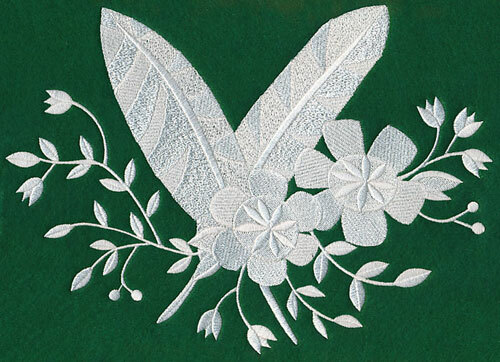 7.81" x 6.56" and 6.98" x 5.86" and 5.77" x 4.85" and 3.86" x 3.25"
A pair of crossed feathers gives this whitework wonder an extra impressive allure due to varying types of stitches and texture. 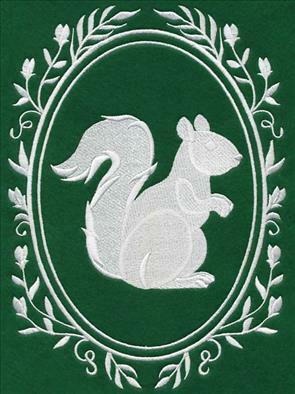 The combination of woodland accents and all-white stitching mean this elegant design is sure to wow. 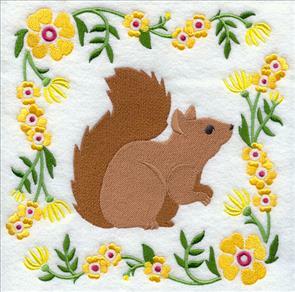 9.47" x 6.90" and 7.80" x 5.69" and 6.62" x 4.83" and 3.85" x 2.81"
Pinecones, acorns, and greenery give this bouquet a rustic, outdoorsy feel. 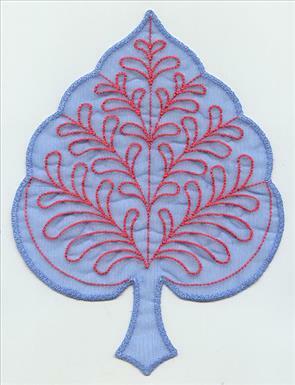 It's a fabulous one-color addition to pillows, quilts, and other cabin-worthy projects. 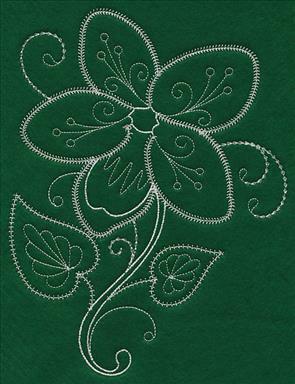 11.25" x 6.90" and 9.41" x 5.77" and 7.81" x 4.79" and 6.86" x 4.21" and 3.87" x 2.74"
Lovely whitework designs are especially stunning when stitched on bold fabric and showcased in a rustic frame. 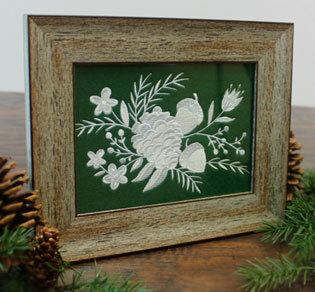 The distressed wood in the frame and the natural elements in the design complement each other beautifully. 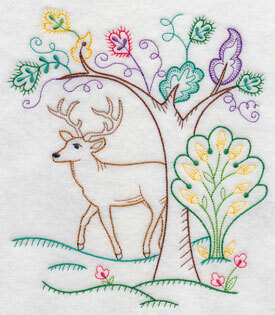 For free project instructions on how to frame your embroidery, click here. 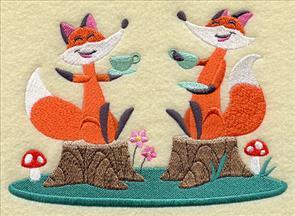 Classic wildlife animals strut their stuff while surrounded by woodland foliage in these circle designs. 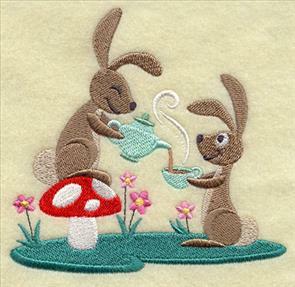 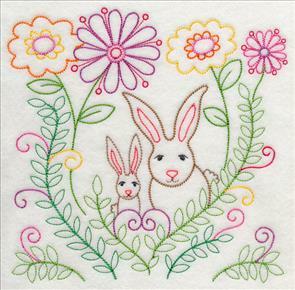 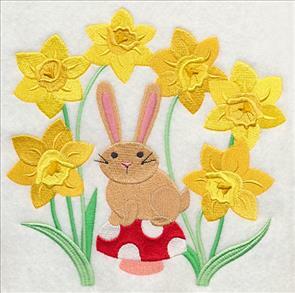 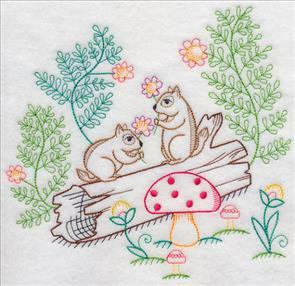 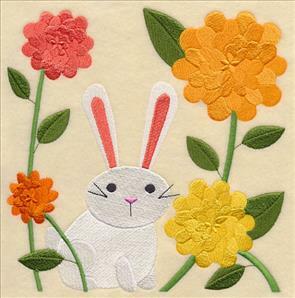 Here a sweet rabbit and charming squirrel are flanked by flowers, mushrooms, and more. 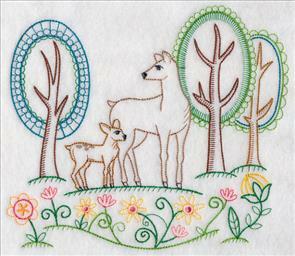 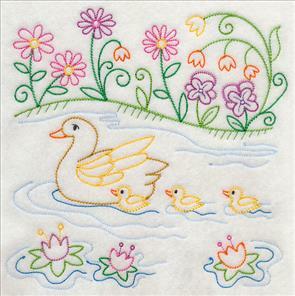 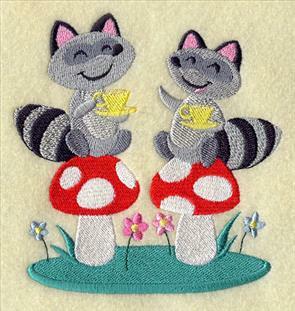 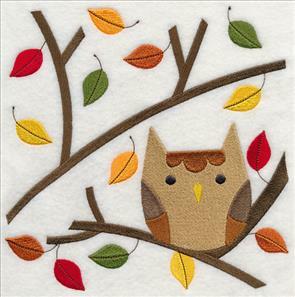 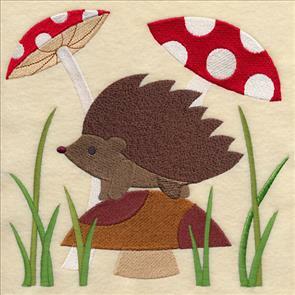 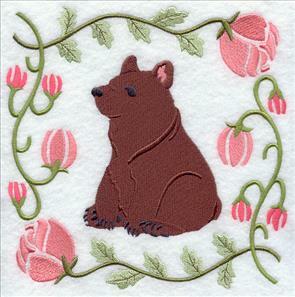 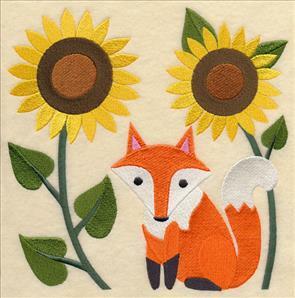 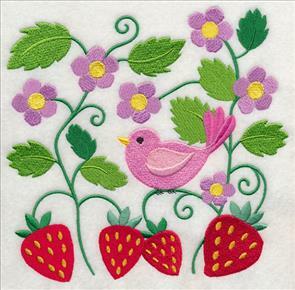 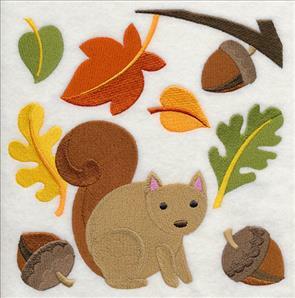 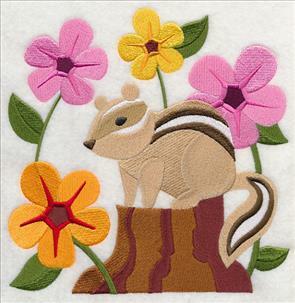 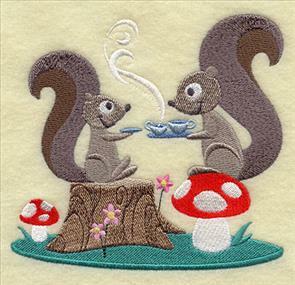 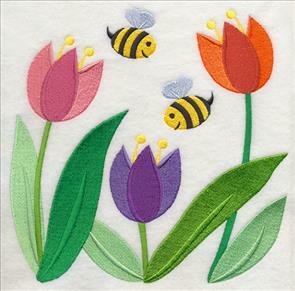 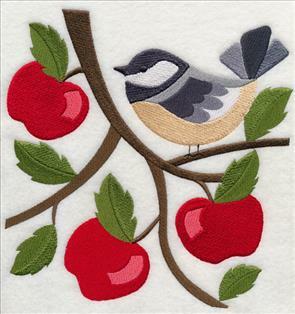 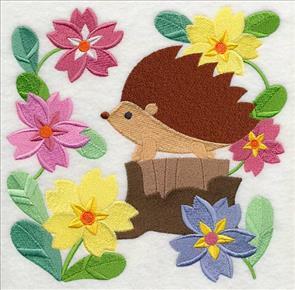 7.80" x 7.82" and 6.85" x 6.86"
7.80" x 7.82" and 6.85" x 6.88"
Stitch the woodland circle scenes as additions to pillows, quilt blocks, wall hangings, and tote bags. 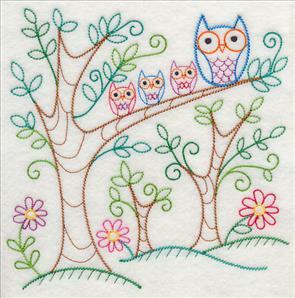 Pick your favorite to use alone, or stitch all four as an eye-catching collection. 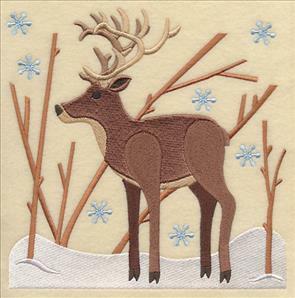 7.80" x 7.79" and 6.92" x 6.91"
5.87" x 5.87" and 4.86" x 4.85"
These wildlife-theme cameos will add a wild look to your next embroidery project! 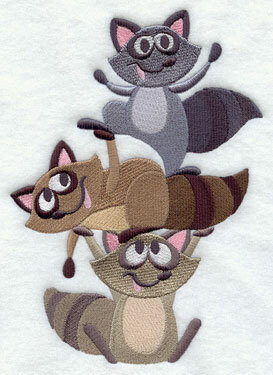 Stitch them all as a collection, or pick your favorite to use alone. 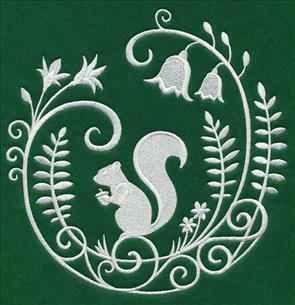 6.83" x 9.40" and 5.77" x 7.80" and 4.86" x 6.57"
Whitework designs contrast beautifully with colorful fabric, making the stitches stand out from their background. 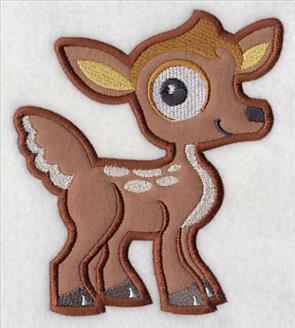 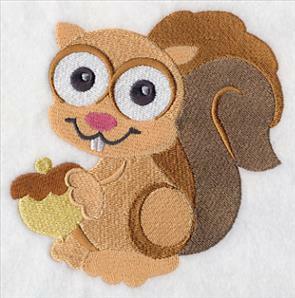 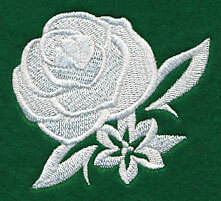 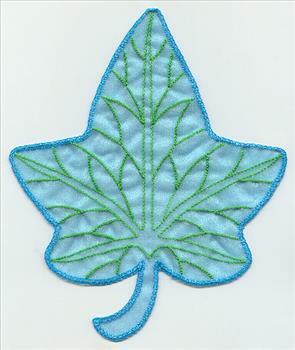 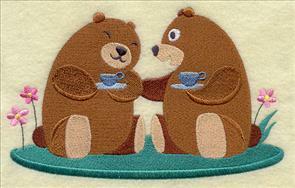 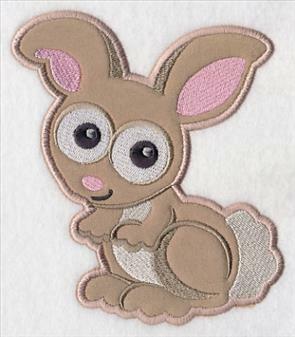 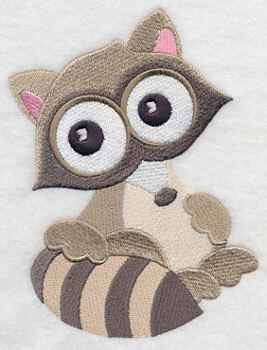 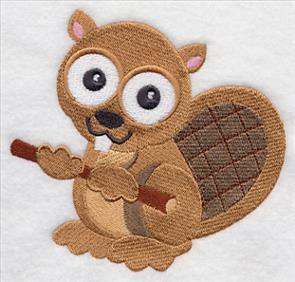 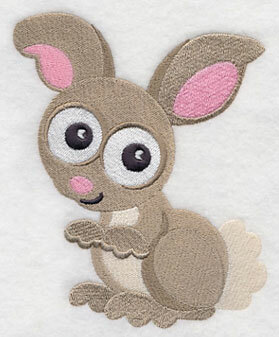 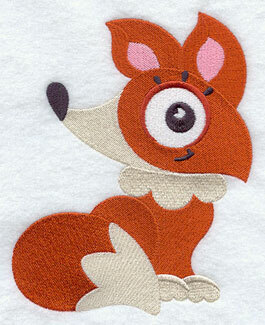 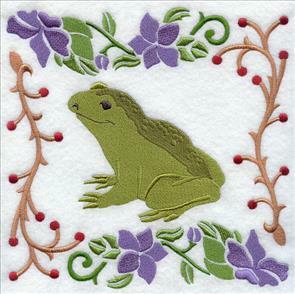 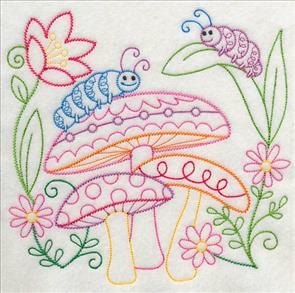 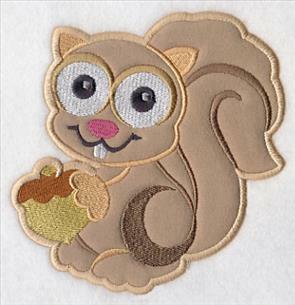 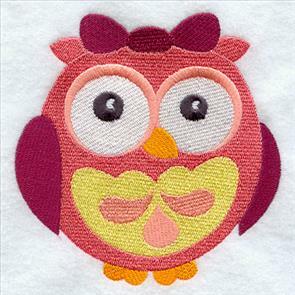 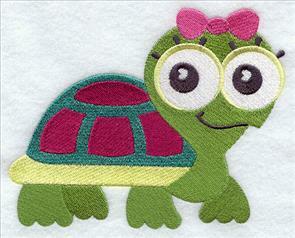 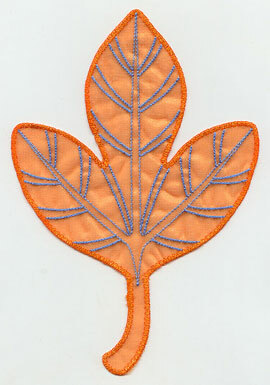 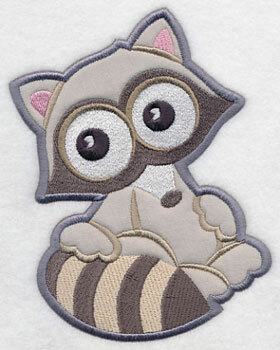 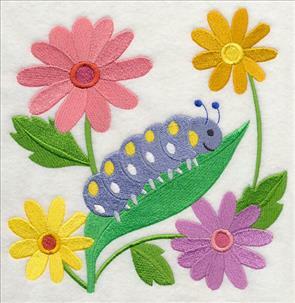 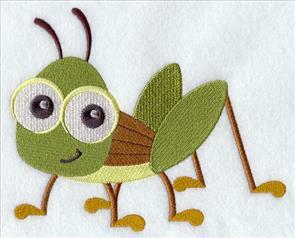 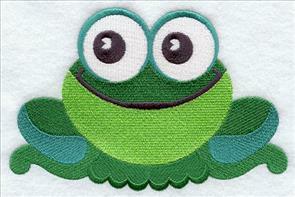 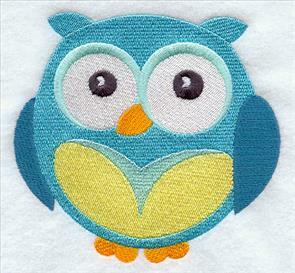 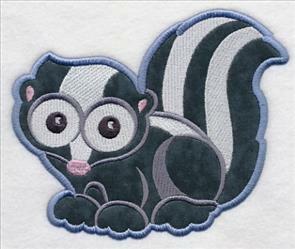 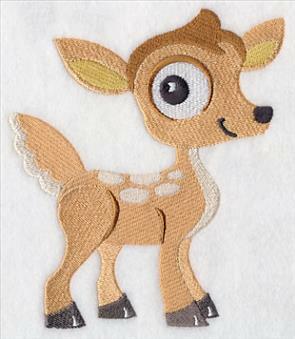 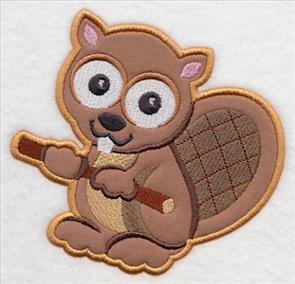 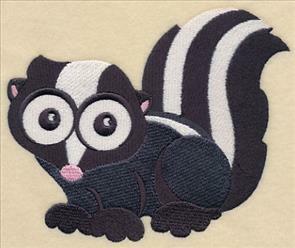 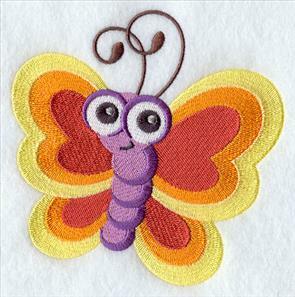 Plus, because the designs use just one thread color, they're a quick-stitching option when embroidering. 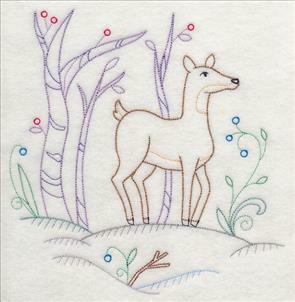 6.90" x 9.40" and 5.73" x 7.81" and 4.85" x 6.61"
A deer, owl, fox, moose, rabbit, and squirrel are all ready to shine on your next project. 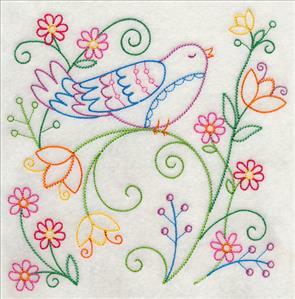 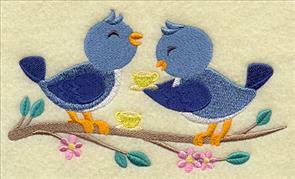 Stitch them on pillows, quilts, blankets, wall hangings, framed pieces, and more. 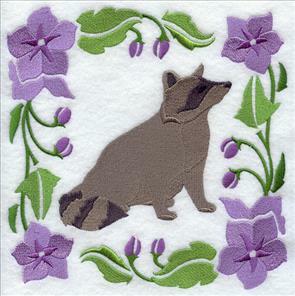 6.90" x 9.39" and 5.74" x 7.81" and 4.86" x 6.61"
Pick your favorite woodland cameo using the links above, or purchased them all in a design pack! 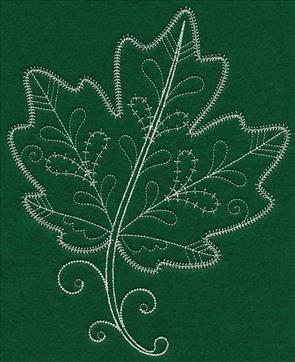 Light and lovely, these delicate woodland whitework designs demonstrate the intricacy and elegance found in nature. 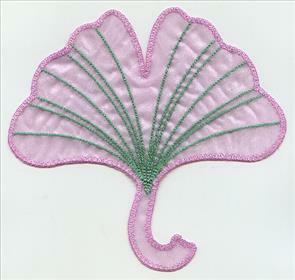 A violet and a feather take on whole new depths of beauty when stitched in this style. 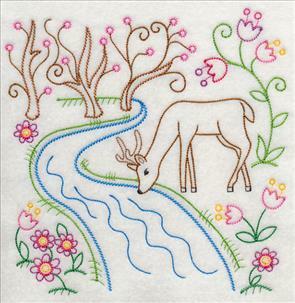 6.85" x 8.94" and 5.85" x 7.64"
6.85" x 10.04" and 5.86" x 8.59"
5.32" x 7.81" and 4.68" x 6.86"
Because these all-natural designs are lighter and use only one color, they're a snap to stitch. 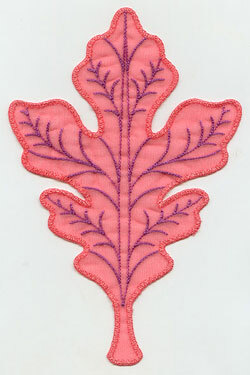 Use them as a fast and fun way to brighten up kitchen, bath, and home decor. 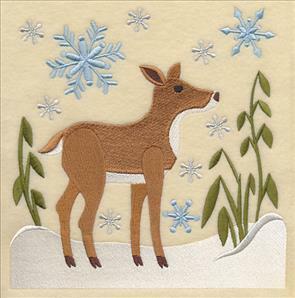 6.85" x 8.55" and 6.26" x 7.82"
5.89" x 7.35" and 4.87" x 6.08"
6.85" x 8.30" and 6.44" x 7.81"
Finish off this series of delicate designs with a cottonwood and an oak leaf. 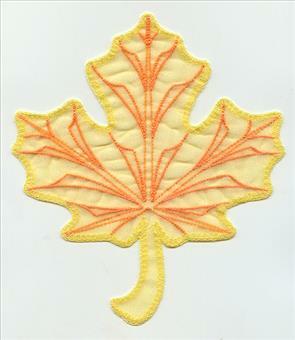 We love the idea of pairing the leaves with the maple version above in one fall-theme project! 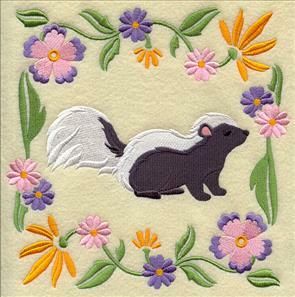 7.21" x 7.80" and 6.85" x 7.41"
5.85" x 6.32" and 4.85" x 5.24"
6.88" x 7.46" and 5.87" x 6.37"
4.85" x 5.26" and 3.56" x 3.87"
If you're excited about the new designs above, take a peek at the rest of our growing collection of woodland designs. 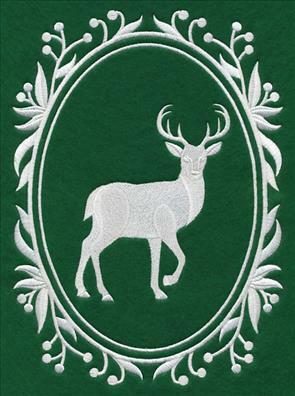 To celebrate the new whitework motifs on sale, we've also discounted dozens of other woodland-theme designs, too! 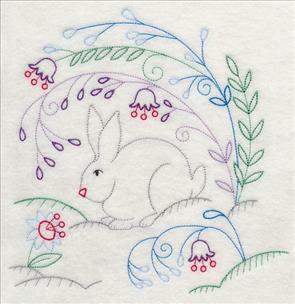 These designs are full of color and provide a nice compliment to this week's whitework motifs. 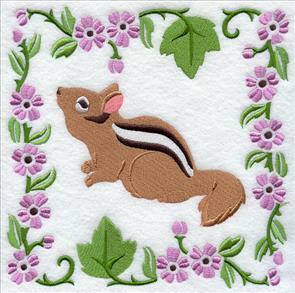 7.47" x 7.80" and 6.90" x 7.21"
7.28" x 7.80" and 6.90" x 7.40"
5.85" x 6.27" and 4.89" x 5.24"
7.26" x 7.80" and 6.90" x 7.40"
6.01" x 5.85" and 5.02" x 4.89"
6.90" x 7.69" and 5.86" x 6.53" and 4.83" x 5.39"
7.80" x 7.39" and 7.29" x 6.90"
6.21" x 5.85" and 5.12" x 4.83"
7.80" x 7.20" and 7.48" x 6.90"
5.97" x 5.85" and 4.94" x 4.85"
7.72" x 7.80" and 6.90" x 6.96"
7.80" x 7.52" and 7.16" x 6.90"
7.80" x 7.61" and 7.08" x 6.90"
6.03" x 5.88" and 5.00" x 4.88"
7.77" x 7.78" and 6.92" x 6.92"
7.79" x 7.78" and 6.90" x 6.88"
5.86" x 5.85" and 4.84" x 4.83"
5.81" x 8.11" and 4.80" x 6.68" and 2.77" x 3.86"
5.86" x 7.39" and 4.81" x 6.06" and 3.07" x 3.86"
5.85" x 6.90" and 4.85" x 5.73" and 3.25" x 3.83"
5.04" x 8.01" and 4.28" x 6.79" and 2.43" x 3.86"
5.07" x 4.84" and 3.87" x 3.70"
6.10" x 3.57" and 3.85" x 2.26"
6.13" x 3.83" and 3.87" x 2.42"
5.50" x 4.85" and 3.87" x 3.41"
6.18" x 4.42" and 3.87" x 2.77"
4.87" x 5.00" and 3.78" x 3.88"
4.87" x 6.15" and 3.08" x 3.88"
6.04" x 4.87" and 3.88" x 3.14"
4.88" x 5.55" and 3.43" x 3.90"
4.86" x 5.69" and 3.32" x 3.88"
5.12" x 4.87" and 3.87" x 3.68"
4.81" x 5.10" and 3.66" x 3.86" and 2.38" x 2.51"
5.90" x 4.83" and 3.86" x 3.13" and 2.51" x 2.04"
6.80" x 4.56" and 3.85" x 2.61" and 2.50" x 1.71"
4.86" x 4.93" and 3.79" x 3.86" and 2.48" x 2.52"
5.86" x 8.32" and 4.83" x 6.85" and 2.71" x 3.85"
7.79" x 7.61" and 7.06" x 6.90"
6.02" x 5.88" and 4.99" x 4.88"
7.80" x 7.61" and 7.06" x 6.89"
6.03" x 5.89" and 5.01" x 4.89"
7.79" x 7.50" and 7.14" x 6.88"
6.10" x 5.87" and 5.06" x 4.88"
7.78" x 7.79" and 6.88" x 6.89"
5.87" x 5.88" and 4.87" x 4.87"
7.78" x 7.72" and 6.92" x 6.87"
7.78" x 7.69" and 6.96" x 6.89"
5.90" x 5.84" and 4.90" x 4.84"
7.79" x 7.68" and 6.99" x 6.89"
5.92" x 5.84" and 4.90" x 4.83"
7.80" x 7.79" and 6.89" x 6.88"
5.88" x 5.87" and 4.86" x 4.86"
7.80" x 7.80" and 6.93" x 6.93"
5.90" x 5.86" and 4.88" x 4.85"
7.80" x 7.57" and 6.90" x 6.70"
6.04" x 5.87" and 5.00" x 4.86"
5.87" x 5.90" and 4.86" x 4.89"
5.90" x 5.87" and 4.88" x 4.86"
5.87" x 5.86" and 4.86" x 4.89"
5.88" x 5.88" and 4.86" x 4.85"
5.90" x 5.88" and 4.87" x 4.86"
7.79" x 7.76" and 6.92" x 6.89"
7.74" x 7.78" and 6.88" x 6.91"
7.79" x 7.77" and 6.90" x 6.88"
5.87" x 5.86" and 4.88" x 4.87"
7.72" x 7.79" and 6.89" x 6.95"
7.79" x 7.80" and 6.90" x 6.92"
7.80" x 7.80" and 6.89" x 6.90"
5.86" x 5.86" and 4.85" x 4.84"